The bambino's nursery (10 nursery must haves) - C.R.A.F.T. 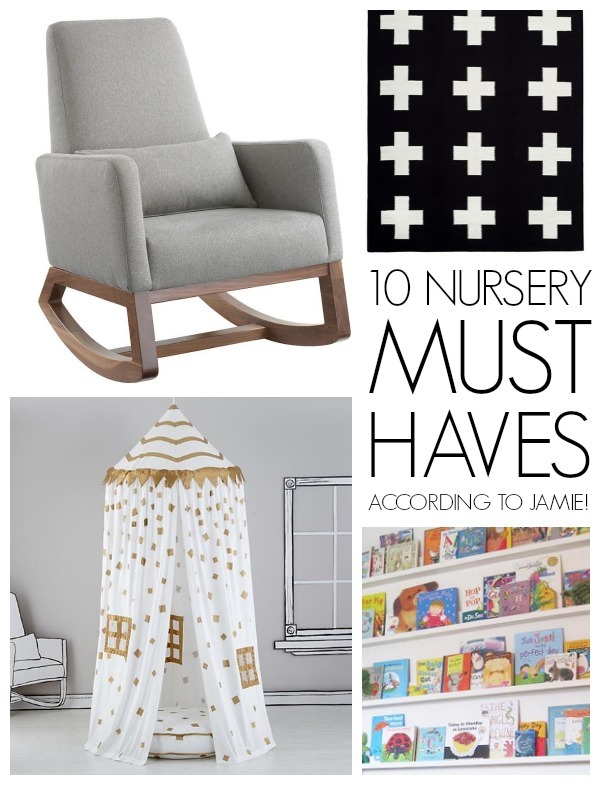 So, here are my 10 nursery must haves. Let me preface this with I’m a first time mom, and these are just my silly ideas! No scientific research done over here, just lots of pinning, thinking and asking around! 1. Gender neutral and not super baby-ish. I want this room to grow with the kiddo. And possibly even be a room that 2 kids (boy or girl) can share one day! Size wise, it’s definitely big enough. 2. Black and white with pops of colors so the room flows with the rest of the house and doesn’t scream baby nursery. I’ve always loved black and white. The pops of color will come mostly from art and fabric. I scored a lot of fun nursery art from my mama’s attic the other weekend! 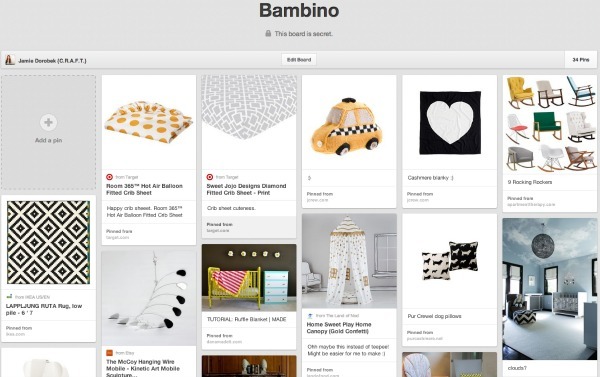 Many of these pieces were actually in my nursery as baby bambino! It’s also uber important to me that the nursery is personal and represents us! Oh and I bought this dresser on Craigslist for $50. 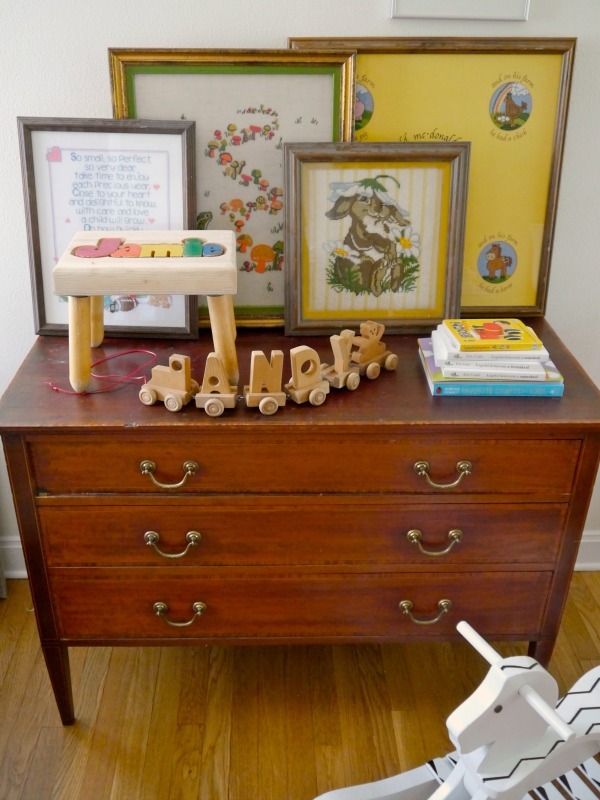 It’s going to be the changing table (another must have, so I’v heard). It may or may not get a makeover ; ) And the rocking horse, is a sneak peek at Friday’s blog post! 3. Have some color of chalkboard something in there. I like to encourage creativity! I recently realized you can paint white chalkboard walls! I don’t know if I’ll do white chalkboard, but I think this wall is going to be the chalkboard wall, inducing the doors. This is currently our bedroom. But, with the bambino addition, I think we’re going to move ourselves to what is now the office, since it’s a longer room and will fit our new king sized bed better! I’ve got fun plans for the C.R.A.F.T. 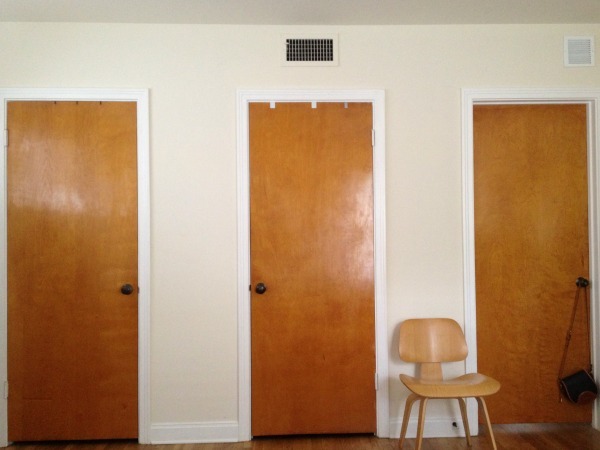 office… it might just end up in this hallway closet! 5. Be a one stop shop for all things kid/baby. Lots of storage for toys and baby paraphernalia. We only have 3 bedrooms, but they’re big! So, I want to take advantage, and make sure that all baby things have a place in that room. I’m picturing a square shelf that can store toys, games, puzzles, maybe something like this. 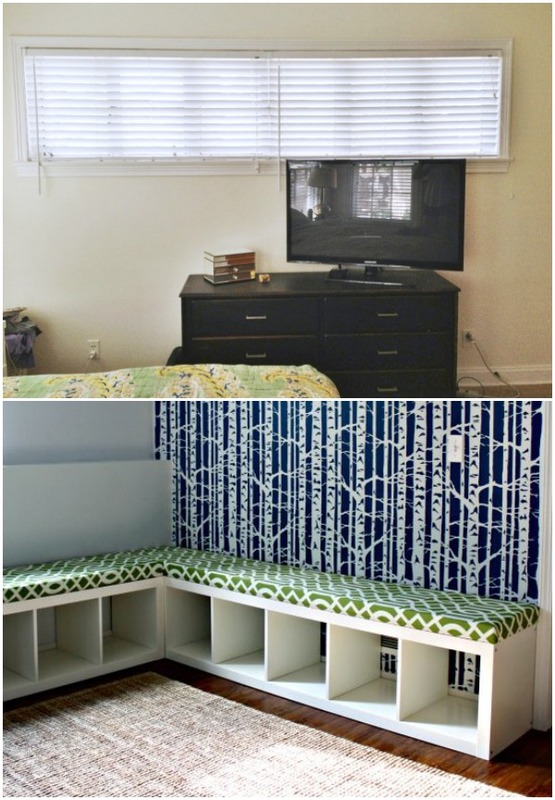 Or maybe even just a bench with 3 cubbies and then I could do bookshelves all around? Oh the possibilities! Here’s the current window situation in the soon to be nursery, and an IKEA hack toy bench that I think would be perfect! 6. House the international book collection we started this summer. I want the books easily accessible to the babe. I found out I was prego on July 17th, just days before we were leaving on a super awesome vay-cay. 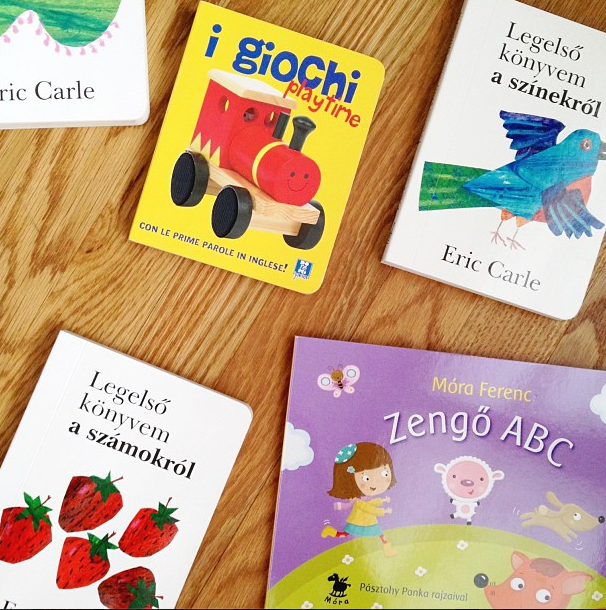 I decided it would be fun to collect kid books from other countries! So, now we need a place for the library! I love the idea of this, this, and this. I want the books to be really easy to grab and even easier to put away! 7. Have a rocking chair. I mean duh, right. 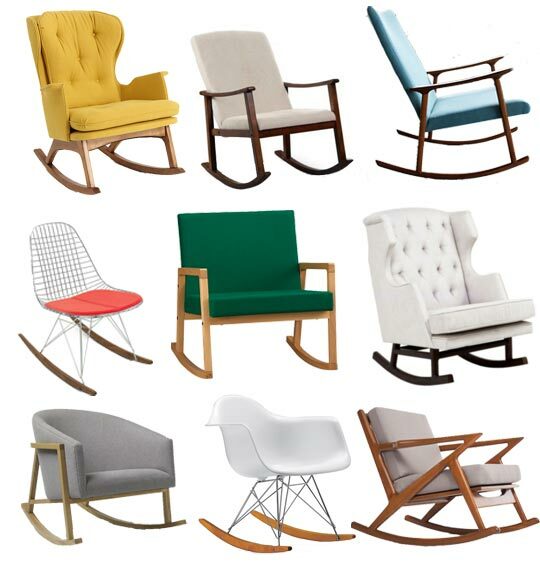 I love rocking chairs anyway. And now I have a really good excuse to buy one! Or recover my mom’s old one, ha! Look at all of these pretty options. Oh my. Which one to chose? I’ve heard it’s nice to have a glider/rocking chair with padded arms to nurse on. So I guess that is one of my criteria. If money were no object I’d probably get this one, ohh or maybe this one, or this one? But, since money is a concern, I have a spooky suspicion I’ll end up using this tutorial to recover my mama’s old glider she used with my little brothers! 8. Have a Jenny Lind crib . I just can’t decide between black or white. My mom thinks it’s hysterical that this is all I’ve ever wanted. Apparently, it was all she ever wanted for her first baby too (that was me)! 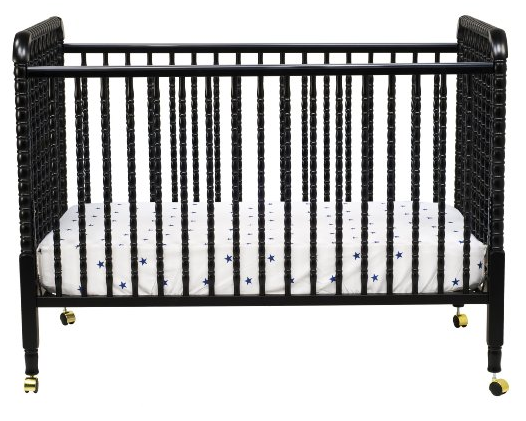 I found this DaVinci Jenny Lind crib the cheapest at Wayfair.com (and there is free shipping)! This black one is so pretty, but I think at the moment I’m actually leaning towards white. Oh looks at those golden casters, me and the bambino need you, Jenny Lind crib! 9. Have a reading nook, near the international book collection. A tee pee or a hula hoop canopy or something else? The hula hoop canopy sounds easiest to make, so that’s probably what I’ll end up with! I actually did a post about hula hoop canopies long ago on C.R.A.F.T.! This one from Land of Nod is pretty dang cute too. 10. Something I sewed! I can sew, just not that well so I think this is kind of a challenge for myself. I think it’s going to be crib sheets! 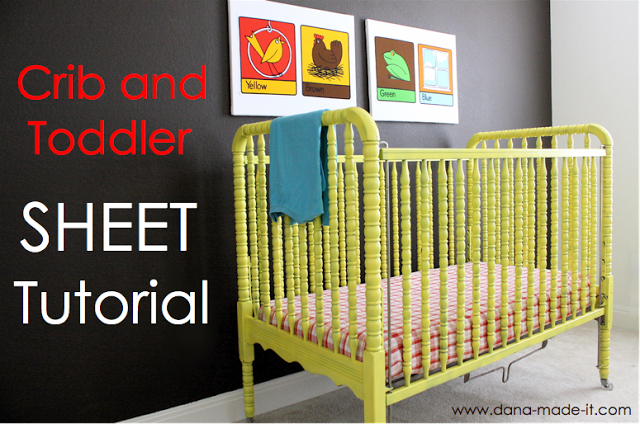 Made has this easy enough looking tutorial and I think it would be fun to have some crazy patterned, colorful sheets made out of extra soft material for the babe to sleep on. So, that’s my list of my 10 nursery must haves. Now, to actually get started on making this list come true, ha! 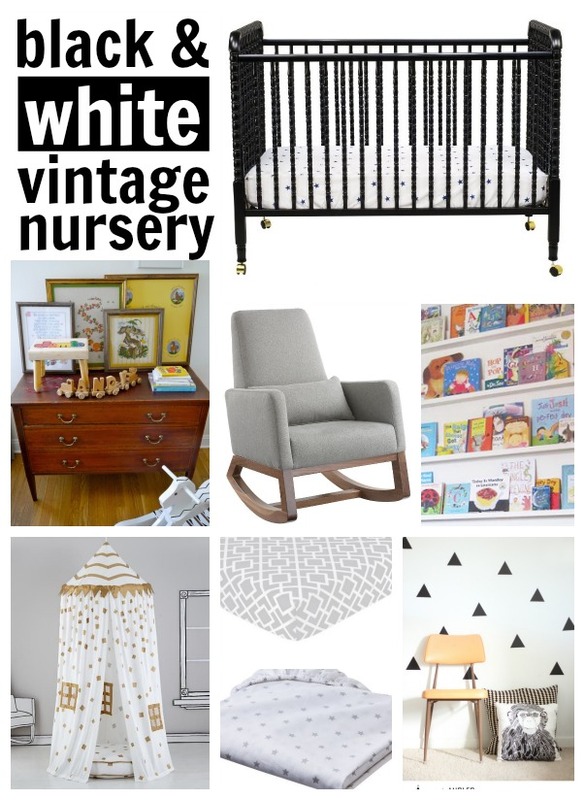 Do you have any nursery must haves? Am I forgetting something? Do share..! Oh and the very 1st DIY nursery blog project is going up on Friday, the sneak peak is in the picture from item #2. This is totally random, but I couldn’t live without a diaper genie. You have some great ideas here…classy and timeless. Like! Love the ideas and as a been-there-done-that Mom, I totally agree with the idea of a room that can grow. My only suggestion to your wishlist is to sit down on your rugs and rub your hands all over them and make sure they’re comfy for tummy time, crawling and just general play. Not all rugs are, especially for sensitive little skin! Congrats again! Love it all! Too funny but we picked out the same cribs! I’m thinking white too, but loved the aqua.